Fort Collins Utilities, a municipal utility, has approved new Time-of-Use (TOU) rates that will be mandatory for residential customers starting October 1, 2018. The rates, shown below, vary by on-peak and off-peak periods during the day as well as by month. The rates also include a surcharge for consumption above 700 kWh per month, for residences other than those with electric space heating. This new TOU rate design includes many of the features that SWEEP advocates including a relatively low monthly fixed charge, a substantial rate differential between on-peak and off-peak periods, no peak demand charge, and a surcharge for high consumption. The new rates better align residential rates with the utility’s cost to generate power during different times of the day and year. Fort Collins Utilities serves about 70,000 customers in Fort Collins, CO. Regional and national energy efficiency professionals gathered Nov. 30-Dec. 1, 2017, in Tempe, AZ, for SWEEP’s 14th Annual Southwest Utility Energy Efficiency Workshop. The annual forum draws leading utility, regulatory, state, federal, non-profit and industry representatives to discuss the status of utility demand-side management (DSM) programs in the Southwest and learn about innovative DSM programs and technologies. The 2017 workshop featured engaging panel discussions with representatives from nine electric and gas utilities that operate in the region, as well as a keynote presentation from Leia Guccione from the Rocky Mountain Institute. In addition, national experts discussed topics such as recent developments in the federal ENERGY STAR program and the U.S. DOE Building Technologies Office, scaling up Zero Net Energy buildings, home energy assessments using smart meter data, use of weather data to enhance energy savings and peak demand reduction, energy savings potential from networked lighting controls, grid edge voltage control, and energy efficiency opportunities in cannabis production. At the workshop, SWEEP presented a Leadership in Energy Efficiency Award to Tim Hogan, executive director of the Arizona Center for Law in the Public Interest (ACLPI). Mr. Hogan provided legal representation for SWEEP before the Arizona Corporation Commission and in other forums for the past 15 years. Earlier, SWEEP presented Leadership in Energy Efficiency Awards to two Nevada legislators, State Senator Pat Spearman and Nevada Assemblyman William McCurdy II, who this year successfully championed new efficiency laws for their state. See the slide presentations here. Find more on SWEEP’s Twitter, Facebook and LinkedIn posts. On Dec. 5th, SWEEP’s Executive Director Howard Geller filed answer testimony in the DSM Strategic Issues docket for Xcel Energy in Colorado (aka Public Service Company of Colorado). In his testimony, Dr. Geller recommended higher energy savings goals and energy efficiency budgets than those proposed by Xcel Energy; a different performance incentive mechanism; revisions in non-energy benefits adder values, and other new or modified policies. He also reviewed the history of energy efficiency policy and Xcel’s energy efficiency program performance over the past decade. In this docket, the Colorado Public Utilities Commission will establish policies including the energy savings goals for Xcel Energy’s energy efficiency programs starting in 2019. The hearing in the docket will take place next March with a decision expected by June. Read Howard Geller's answer testimony here. Read Attachments to the answer testimony here. TODAY please donate to SWEEP on Colorado Gives Day. First Bank Foundation matches part of the donations, and your contribution may be tax-deductible. Check out today's photos from Las Vegas (including Sen. Spearman getting an assist from her niece, Gabby) on SWEEP's social media pages, as Executive Director Howard Geller presents the 2017 Leadership in Energy Efficiency Awards to Nevada Assemblyman William McCurdy II and Nevada State Senator Pat Spearman. Howard will give Arizona public interest lawyer Tim Hogan his award next week in Tempe. The Weather Channel recently interviewed SWEEP's Howard Geller in a longer story about NOAA's supercomputer located in Cheyenne, WY. The article explores the paradox of Wyoming hosting the machine that crunches numbers for climate scientists in a state that remains determined to save coal-fired power plants. Mountain Town News extensively quotes Will Toor, SWEEP's transporation program director, about why electric vehicle sales continue to proliferate. Today they constitute just 10,000 or so among the 5 million-plus cars, trucks, and motorcycles. But the growth rate for EVs has averaged 41 percent since 2012, and this year sales are up 73 percent over the same months of last year. The Salt River Project’s (SRP’s) energy efficiency efforts enabled its customers to realize annual incremental savings of 570,409 megawatt-hours (MWh) per year as a result of energy efficiency programs the utility implemented in fiscal year 2017. This level of energy savings represents 113 percent of the utility’s goal for fiscal year 2017 programs. The savings equate to the amount of energy needed to power more than Arizona 30,000 homes for a year. SRP serves about 1.0 million customers in Arizona. Click here for a copy of SRP’s FY 2017 Energy Efficiency report. SWEEP Executive Director Howard Geller and Arizona Representative Jeff Schlegel made four presentations at the 2017 ACEEE Energy Efficiency as a Resource conference held Oct. 30 - Nov. 1, 2017 in Litchfield Park, AZ. The presentations review utility energy efficiency policy and program trends in the SWEEP region, innovative technologies and program design strategies from utilities in the Southwest, and the treatment of energy efficiency resources in utility Integrated Resource Planning. Update on Utility Energy Efficiency Policies and Programs in the Southwest. Innovative Utility Energy Efficiency Programs from the Southwest. After Lighting: Utility Claimable Savings. Modeling and IRP Analysis of EE Resources in the Southwest. Green Fire Times, a New Mexico magazine focused on sustainability in the Southwest, published an analysis by SWEEP’s Tammy Fiebelkorn about how the Land of Enchantment’s energy efficiency efforts compare with other states. The U.S. Department of Energy has honored six Southwest homebuilders with the 2017 Housing Innovation Awards, the most competitive event in four years, DOE said. The 26 awards were given out at the 2017 Energy and Environmental Building Alliance (EEBA) High Performance Home Summit in Atlanta, GA, on October 10-12, 2017. This year’s Grand Winner was Thrive Home Builders, headquartered in Denver, Colorado. DOE also recognized 11 other applicants with honorable mentions. Revive Properties and Philgreen Construction, Fort Collins, Colorado. Read more about the builders and awards. Discover more about why Reno’s recently adopted energy efficiency policy will be good for the local economy as well as Nevada’s clean air and water resources. Written by Jim Meyers, director of SWEEP’s buildings program, the blog also describes the city’s outreach to the business community. Read Jim Meyers’ blog here. Anyone interested in energy efficiency throughout the Southwest will find that SWEEP’s new fact sheets and research papers contain good information. Learn what SWEEP Executive Director Howard Geller says about the regional benefits (economic as well as environmental) of saving energy. Find out what Jim Meyers’ expert eye observed at the recent Solar Decathlon, an international event that also emphasized energy efficiency. Jim took lots of pictures, which are featured in his blog. Delve deeper into the Southwest’s energy future with other blogs on electric vehicles, untangling traffic congestion, green buildings and many other topics analyzed and explained on SWEEP’s blog page. Passive House certification with on-site renewables. The resolution, thought to be the most ambitious such policy in the nation, is an important step in helping Park City achieve its goal of making municipal facilities be net-zero in carbon emissions, and to be powered by 100 percent renewable electricity, by 2022. Net-zero-energy buildings are highly energy-efficient buildings that produce as much on-site renewable energy as they consume over the course of a year. They can play a central role in improving air quality and reducing climate change emissions. Utah Clean Energy, in partnership with the Southwest Energy Efficiency Project, stimulated Park City's interest in this important policy through an industry workshop in April 2017, and helped shape the policy through sharing feedback with Park City staff. Utah Clean Energy congratulates Park City for taking a leadership role on net-zero-energy buildings. Learn more about the resolution by reading Park City's press release. and direct APS to consider an expanded level of DSM investment. On October 18, 2017, the City of Reno launched REENERGIZE RENO, its ambitious program to improve the efficiency of commercial, industrial and multifamily buildings by 20 percent by 2025. REENERGIZE RENO is part of the U.S. Department of Energy's Better Buildings Challenge, designed to cut energy waste in large buildings. Reno joins 45 pioneering cities working to boost local economies and reduce climate pollution by facilitating energy efficiency improvements in buildings. Maria Vargas, Director of the U.S. Department of Energy’s Better Buildings Challenge, joined city, business, and community leaders at the REENERGIZE RENO kickoff, held Wednesday at the University of Nevada-Reno. Local leaders also cited SWEEP’s studies, on the economic benefits that energy efficiency brings Nevada, when they presented the program to an audience of 80 business, government, and academic leaders who participated in the REENERGIZE RENO/Better Building Challenge campaign kickoff. See the local TV coverage of the kickoff. The City Council of Steamboat Springs, Colorado, has approved adoption of the 2015 International Energy Conservation Code (IECC), while the County Commissioners in surrounding Routt County also have voted to approve an amended 2015 IECC. SWEEP funded trainings and worked with a large stakeholder group over the past year to advance the energy code in the northwest part of Colorado, in coordination with the Yampa Valley Sustainability Council, the Colorado Energy Office, and Colorado Code Consulting. The City of Steamboat and Routt County join a growing list of at least 30 Colorado cities and counties that have updated to this newer-and-better energy code to save residents and businesses money, and to increase the durability, affordability, and comfort of homes and buildings. The nearby towns of Oak Creek and Yampa are scheduled to vote on the 2015 IECC in October. More info on Routt County’s and Steamboat’s codes are online here. For more info, contact Suzie Romig of the Yampa Valley Sustainability Council. The Colorado Department of Public Health and the Environment (CDPHE) has released a draft plan on how the state will allocate approximately $70 million in funding that the state will receive as part of the settlement of the VW emissions cheating scandal. The settlement funds are designed to reduce air pollution from vehicles, in order to mitigate the effects of the non-compliant, diesel-fueled Volkswagens. “The state’s draft plan, released in September 2017, does a good job of responding to this input, and calls for making meaningful investments in electrification of Colorado’s cars, trucks and buses. Still, there are few ways the plan could be strengthened,” said Will Toor, director of SWEEP's program. Increase investment in electric vehicle charging infrastructure, electrify the city’s own fleet, and encourage the use of electric vehicles through incentives, so that 80 percent of passenger vehicles are clean electric vehicles by 2050. SWEEP staff served on the Stakeholder Group that prepared the draft strategy, which includes many of SWEEP’s specific recommendations. The city is now soliciting comments on the draft, which are due by October 31. Here is the link for more details and for submitting comments. The Salt Lake City Council has adopted new rules that will help building tenants, investors and owners track (or benchmark) energy use, a move that could improve the city’s energy savings and air quality. The new ordinance requires owners of commercial buildings larger than 25,000 square feet to provide the city with an annual measure of their energy usage. SWEEP and its partner, Utah Clean Energy, advocated for the measure and provided useful data to inform city officials about the benefits of benchmarking buildings' energy use. The new ordinance could help the city meet its goal of using 100 percent renewable electricity by 2032 and reducing carbon emissions by 80 percent by 2040. Currently, non-residential buildings represent approximately 51 percent of Salt Lake City’s community-wide carbon footprint. The rules first establish an annual benchmarking and data reporting requirement designed to increase the number of building owners and tenants regularly tracking energy use. The ordinance is phased-in over several years starting with municipal facilities in 2018 and large private buildings in 2019 or 2020, depending on the size. The policy increases market transparency by making is easier for prospective business tenants and real estate investors to identify which buildings in Salt Lake City are among the most energy efficient. Beginning in 2020 buildings that are less efficient than the national average will be required to investigate energy “tune-ups” every 5 years, though implementation of the tune-ups remains voluntary. “SWEEP and Utah Clean Energy applaud Mayor Jackie Biskupski and the Salt Lake City Council for their leadership on this issue,” said Kevin Emerson, Director of Energy Efficiency Programs for Utah Clean Energy. Read more about Salt Lake City’s benchmarking ordinance. Read an op-ed from local business leaders who supported the ordinance. And read the full ordinance. The City of Reno, NV, has taken its first initiative to curb climate pollution by launching a city-led Better Buildings Challenge. The resolution, adopted Aug. 23, 2017 on a unanimous council vote, means Reno will start a voluntary leadership program targeting commercial, institutional, multi-family and industrial buildings. Reno’s building challenge program is an element of its City Energy Project plan, a national push to reduce air pollution and greenhouse gases, by improving the energy efficiency of large buildings in 20 major U.S. cities. Launched in 2011 by the U.S. Department of Energy (DOE), the Better Buildings Challenge is a voluntary leadership program designed to improve the efficiency of commercial, institutional, multifamily, and industrial buildings by 20 percent over 10 years. Reno will join nearly 50 communities nationwide that have initiated buildings challenges in their communities. The vote comports with policies previously articulated by Mayor Hillary Schieve and many council members that make sustainability and climate protection priorities for the community, through both energy efficiency and renewable energy. Among other things, city leaders have passed previous resolutions supporting clean power and renewable energy; joined legal proceedings in defending the Clean Power Plan; and participated in the Ozone Advance Program Partnership. The City Energy Project is a national initiative to cut energy waste in large buildings while making American cities healthier and more prosperous. Reno’s proposal included a key pledge to launch a voluntary buildings challenge that will jump-start energy efficiency investments in existing, large commercial buildings. Reno wants to lead by example and has committed to reducing energy and water use by 20 percent in its portfolio of buildings. As a cornerstone of the program, partners and community leaders who participate will be recognized for their efforts. The recognition program will showcase local leaders through case studies, press releases, blogs and social media, an annual awards program, and more. SWEEP strongly supported the Better Buildings Challenge and had submitted a statement advocating for its adoption during the council’s public comment period. Read the city council’s Better Buildings Resolution here. SWEEP has published a database of Zero Energy Buildings in the Southwest. This information provides a view at the level of zero-energy construction in the Southwest, which buildings have reached Zero Net Energy, and those that are on the path to zero energy use. The database includes both residential and commercial buildings on the path to zero. When looking at the U.S. DOE Zero Energy Ready Home program, the six states in the SWEEP region (AZ,CO, NV, NM UT and WY) lead the nation in construction of these buildings. SWEEP has completed a study commissioned by the City of Denver, with funding from the Regional Air Quality Council, which analyzes how the city and state can accelerate electric vehicle (EV) adoption. The report recommends deploying more fast-charging EV stations across Colorado, and encouraging the development of more charging locations at apartments and condominiums. The study will help guide public investment in EV charging. The study also quantifies the air quality benefits of EVs in the Denver area. The National Renewable Energy Laboratory conducted a companion study, which modeled a range of possible statewide fast charging networks. Monetize and value avoided CO2 emissions and possibly other pollutant emissions. The report was funded by the U.S. Department of Energy through a contract with Lawrence Berkeley National Laboratory. A new report completed by SWEEP’s partner Utah Clean Energy recommends ways that Salt Lake City can expand energy efficiency improvements in low-income housing. The report reviews current low-income energy services and provides five recommendations for steps the city can take to increase the number of low-income families that benefit from home energy retrofits. The report was requested by Salt Lake City and prepared through U.S. Department of Energy funding that SWEEP provided to Utah Clean Energy. Click here for a copy of the Affordable Energy for All: A Plan to Expand Energy Efficiency Benefits for Low-Income Salt Lake City Residents report. A member of the Colorado Energy Codes Collaborative and Regional Codes Leadership Group, Shaunna Mozingo, has received one of the nation’s top awards for advancing energy codes. Shaunna received the 2017 Jeffrey A. Johnson Award for Excellence in Building Energy Codes, presented at the National Energy Codes Conference in Pittsburgh, PA., on July 18, 2017. Shaunna is a key collaborator on the SWEEP building team’s efforts to increase energy efficiency through building codes. All of us in the Southwest are fortunate to have her dedication, expertise, and enthusiasm for energy codes. Congratulations to Shaunna for this well-deserved honor. See the photos and nomination at the Colorado ICC Chapter site. Rocky Mountain Power, the largest electric utility in Wyoming, reports that its energy efficiency programs helped its customers achieve annual energy savings of over 40 million kilowatt hours (kWh) in 2016. This is a 29 percent increase compared to the savings achieved by the utility’s programs in 2015. Most of the increase in energy savings was due to growing participation by larger oil and natural gas producers. In addition, there was a significant increase in the number of lighting efficiency projects undertaken by businesses. Rocky Mountain Power, a division of PacifiCorp, serves about 140,000 customers in Wyoming. Close to 200 Utah municipal building code officials, building inspectors, plan reviewers, and residential contractors now have a guide to help them comply with Utah’s latest residential energy efficiency code. The state adopted an amended version of the 2015 International Energy Conservation Code in March 2016, with specific changes becoming effective between July 2016 and January 2021. State energy code trainer Brent Ursenbach developed the guide with assistance from the Governor's Office of Energy Development, Rocky Mountain Power, and Questar Gas (now Dominion Energy) to help improve residential energy code compliance in Utah. In mid-July, SWEEP’s partner, Utah Clean Energy, mailed the guides along with a letter from the Governor’s Office of Energy Development to building officials and local home builders associations across the state, in an effort to achieve energy and cost savings resulting from the newer residential energy code. Utah Clean Energy received funding from SWEEP to promote and distribute the guides. SWEEP encourages all building professionals in the Southwest to develop compliance materials to support the efficiencies incorporated into the 2015 International Energy Conservation Code (IECC). Click here for a copy of the Energy Code Guide for Residential Projects in Utah. On July 10, Denver Mayor Michael Hancock announced the adoption of a new Mobility Action Plan. It calls for a significant increase in investment in bicycle and pedestrian infrastructure, expanded public transit including building bus rapid transit on Colfax Avenue and other major corridors; expanding transit pass programs, investing in expanded electric vehicle infrastructure, and doubling the growth rate of electric vehicle adoption in the city. SWEEP has advocated for Colfax BRT, increased investment in bicycle and pedestrian infrastructure, and a variety of initiatives to increase EV adoption in Denver. SWEEP applauds Mayor Hancock for taking this action to improve mobility while reducing energy use and emissions. On June 28, the Utah Public Service Commission approved a docket allowing Rocky Mountain Power to invest $10 million over the next five years in electric vehicle (EV) infrastructure, providing customer education on EVs, and creating pilot time-of-use rates for EVs. RMP will offer incentives up to $7,000 for Level 2 chargers, and up to $63,000 for DC fast chargers. The final decision incorporated multiple changes suggested by SWEEP and Utah Clean Energy. SWEEP encourages all utilities in the Southwest to develop EV investment plans and EV-specific tariffs. Two major utilities in the southwest have teamed up with Nissan to offer their customers $10,000 discounts on Nissan Leafs. In Colorado, Xcel Energy offered a program from March-June, and while final numbers are not yet available, as of mid-June they reported more than 500 vehicles sold. Xcel customers also benefit from the $5,000 point of sale incentive that the Colorado legislature approved in 2016. In Arizona, Salt River Project has a discount program available to customers during the month of July. SWEEP encourages other utilities in the southwest to offer similar programs. SWEEP has published an online handbook for organizing this type of program. El Paso Electric Company reports that its New Mexico customers saved nearly 106 gigawatt hours in 2016 from cumulative energy efficiency programs implemented by the utility during 2008-16. At this level of energy savings, the utility has already met the state statutory requirement of achieving 8 percent savings (based on 2005 retail electric sales) by 2020 or sooner. El Paso Electric Company is the first electric utility in New Mexico to meet the 2020 energy savings requirement. SWEEP congratulates El Paso Electric for achieving the requirement four years earlier than necessary, and in doing so, cutting utility costs by more than $50 million net. El Paso Electric is continuing to implement a comprehensive set of energy efficiency programs for its New Mexico customers, meaning it will go well beyond the minimum energy savings requirement in law. El Paso Electric Company serves about 95,000 customers in and around Las Cruces, NM. Allowing the PUCN to adopt a rate adjustment mechanism so that utilities are not harmed financially when they help their customers save energy. SB 150 will result in hundreds of millions of dollars in additional utility bill savings for households and businesses over the next decade, based on estimates by SWEEP. SWEEP thanks Governor Sandoval for his approval and Senator Spearman for her leadership on the bill, as well other organizations that supported the bill including NV Energy. Click here for a copy of SB 150. Click here for a copy of SWEEP’s fact sheet about SB 150. Click here for SWEEP’s press release on passage of SB 150 by the Nevada legislature. Click here to see Gov. Sandoval after he signed SB 150.
and Nevada Power Company – tied for 35th. SWEEP congratulates Xcel Energy Colorado for making it into the top ten utilities in the ACEEE rankings. SWEEP urges all five utilities to strive for higher scores in the future by expanding energy efficiency programs and increasing energy savings for the customers they serve. In addition, the Southwest utilities could improve their scores if states adopted new policies to spur stronger utility energy efficiency efforts in the future. Nevada has become the latest state to adopt laws that will encourage consumers to buy and use electric vehicles. On May 31, Gov. 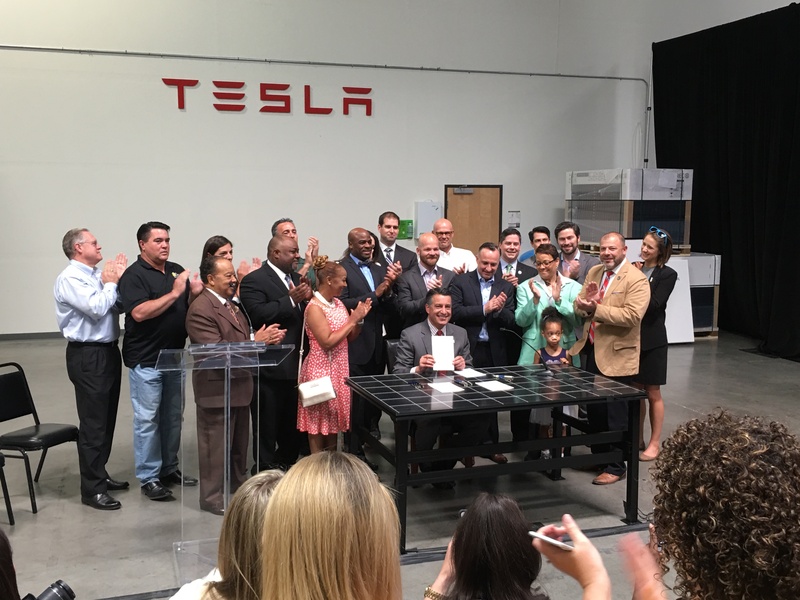 Brian Sandoval signed SB145, which establishes a statewide policy to expand the use of electric vehicles and creates an Electric Vehicle Demonstration Program. The legislation also will require utilities to submit plans to the Public Utilities Commission of Nevada showing how they will invest in charging stations and other infrastructure for electric cars. The measure further instructs the PUCN to instruct utilities to otherwise support customer adoption of electric vehicles. “SB 145is an important step forward for electric vehicles,” said Will Toor, director of SWEEP’s transportation program. The measure enjoyed bipartisan support, passing the state senate 20-1 and the state Assembly 36-5 with one absence. SWEEP supported SB 145 and has provided input to the PUCN on priorities for electric vehicles charging investments, as part of the commission’s investigatory dockets on EVS. Rocky Mountain Power (RMP) reports that its 2016 energy efficiency and load management (DSM) programs helped its Utah customers save 308 million kWh per year, equivalent to the electricity use of about 35,000 typical households in the state. The savings continued to increase year-over-year as the utility expanded and refined its DSM program offerings. In addition, RMP estimates that its 2016 programs had an average benefit-cost ratio of 1.92 and will result in $124 million in net economic benefits for the households and businesses it serves. RMP, a subsidiary of PacifiCorp, provides electricity to about 860,000 customers in Utah. Congratulations to Denver, CO, for ranking among the top 10 most energy-efficient cities, according to the American Council for an Energy Efficient Economy. The ACEEE reviewed efficiency policies and efforts in 51 large U.S. cities and said only Denver, at number 9, made the top 10 among major municipalities in the Southwest. In SWEEP’s region, Phoenix ranked number 14 and scored among the “most improved” cites. Salt Lake City came in at number 23 and Las Vegas scored at 32, although both communities are instituting new efficiency and clean-energy measures. Read the full ACEEE report. Public Service Company of New Mexico (PNM) helped its customers save 82 gigawatt hours (GWh) per year from energy efficiency programs implemented in 2016, nearly equal to 1 percent of the electricity consumed by customers of the utility. The savings in 2016 were the most achieved by the utility since its energy efficiency programs began in 2008. PNM is on track for complying with the state's Energy Efficiency Resource Standard, which requires 8 percent energy savings by 2020 from energy efficiency programs implemented during 2008-2020. According to PNM, energy efficiency programs implemented in 2016 save electricity at an average cost of 2.4 cents per kilowatt hour (kWh) saved. In addition, PNM projects that energy efficiency measures installed in 2016 will cut power plant water consumption by 259 million gallons and reduce CO2 emissions by 494,000 tons. SWEEP supports PNM in the design of its energy efficiency programs and participates in the regulatory approval process. Click here for a copy of PNM’s 2016 Energy Efficiency Program Annual Report. The U.S. EPA has approved a plan submitted by Volkswagen to the first tranche (portion) of the $2 billion Zero Emission Vehicle investment fund, which is one element of the civil settlement over VW's emissions cheating. This tranche allocates $275 million to building electric vehicle charging stations and $25 million to brand neutral public education. VW will invest in approximately 240 fast chargers along interstate highways, and will invest in charging in workplaces, public locations and multifamily housing in 11 metropolitan areas, including the Denver area. This is in addition to the $2.7 billion environmental mitigation fund, which allows states to allocate money directly to EV charging and electrification of heavy duty fleets. The EPA estimates that the VW funds will meet approximately 10-15 percent of the unmet demand for charging in the designated metro areas. Read more about the EPA plan here. Read more about the VW mitigiation fund here. In 2017, the Environmental Protection Agency (EPA) and Department of Energy (DOE) recognized 152 ENERGY STAR partner organizations for outstanding achievements in energy efficiency. SWEEP congratulates the nine award winners with operations based in the Southwest region. In addition, AZ Energy Efficient Home (Phoenix, AZ) was awarded Contractor of the Year, an honor given to Home Performance with ENERGY STAR participating contractors who exhibit outstanding professionalism, build strong customer relationships, and apply building science solutions to improve homes. Visit the ENERGY STAR website for a complete list of award winners and details about their energy efficiency accomplishments. Xcel Energy reports it achieved 410 gigwatt hours (GWh) per year of electricity savings and 89 megwatts (MW) of peak load reduction at the generator level from demand-side management (DSM) programs implemented in 2016 in Colorado. The electricity savings were equal to 1.3 percent of the utility’s retail electricity sales on a net savings basis, and surpassed the savings goal established by the Colorado Public Utilities Commission. Xcel Energy estimates that its 2016 electric DSM programs will provide its customers with $116 million in net economic benefits over the lifetime of measures installed last year. In addition, Xcel Energy reports that its natural gas efficiency programs helped customers save 615,000 dekatherms of gas per year, matching the company’s gas savings goal. Xcel Energy is the largest electric and gas utility in Colorado with approximately 1.4 million customers. Arizona Public Service Company (APS) helped its customers save 480 gigawatt hours (GWh) per year from energy efficiency programs implemented in 2016 (savings at point of use), while Tucson Electric Power Company (TEP) helped its customers save 148 GWh per year. Both utilities increased savings compared to program performance in 2015 and are on track in complying with the state’s Energy Efficiency Resource Standard, which requires 20 percent savings from energy efficiency programs by 2020. The programs are also yielding substantial economic and environmental benefits. APS indicates its 2016 programs will provide $69 million in net benefits for customers, while TEP’s programs will provide $61 million in net benefits. The two utilities also project that over their lifetime, the energy efficiency measures installed in 2016 will cut power plant water consumption by 2.7 billion gallons and CO2 emissions by 4.0 million tons. SWEEP supported the utilities by providing recommendations on energy efficiency program design as well as with obtaining regulatory approvals. Click here for a copy of APS’s Annual DSM Report. Click here for a copy of TEP’s Annual DSM Report. PacifiCorp, the main investor-owned utility in Utah and Wyoming through its Rocky Mountain Power subsidiary, has issued its 2017 Integrated Resource Plan (IRP). The 2017 IRP calls for a energy efficiency programs to meet 88 percent of forecasted load growth during 2017-26 for PacifiCorp as a whole. But because forecasted load growth in the 2017 IRP is lower than that in the utility’s 2015 IRP, the energy savings goals for programs in Utah decline compared to energy savings goals there in recent years. The energy savings goals in Wyoming continue to increase in the next decade. Click here to get a copy of the new PacifiCorp Integrated Resource Plan. The Utah Public Service Commission (PSC) has approved a new approach for recovering the cost of energy efficiency and other demand-side management (DSM) programs in Utah. Starting in 2017, DSM expenditures by Rocky Mountain Power will be capitalized and amortized over 10 years. Until amortized, these investments will earn a return equal to the utility’s pretax weighted average cost of capital. Previously, DSM expenditures were expensed and recovered through a utility bill surcharge and balancing account. The new cost recovery mechanism was authorized in legislation approved in Utah in 2016. Rocky Mountain Power, a subsidiary of PacifiCorp, is the one investor-owned electric utility that serves about 860,000 customers in Utah. Click here for a copy of the PSC order. Click here for a copy of the legislation authorizing this new cost recovery mechanism. The City of Boulder, Colorado, has put its residential energy code on a path to net zero. Under the new code, approved unanimously by the city council March 7, all new homes larger than 5,000 square feet must be built to meet net-zero energy consumption (i.e. very energy efficient and producing as much energy as they use over the course of a year). Smaller homes will gradually face similar requirements, with all new residential construction meeting net-zero targets by 2031. Major renovations to existing homes will also trigger the stricter requirements. Boulder’s code also requires that new buildings be solar-ready and electric vehicle-ready, and have sustainable landscaping. PacifiCorp has completed a Demand-Side Resource Potential Assessment for the period 2017-36 to help inform its upcoming 2017 Integrated Resource Plan (IRP). The study found achievable savings potential of 5.8 million megawatt hours (MWh) in Utah by 2036, which is equal to about 22 percent of the electricity used in PacifiCorp’s Utah service area during 2016. The study also shows achievable savings potential of 1.7 million MWh in Wyoming by 2036, which is equal to about 17 percent of electricity used in PacifiCorp’s Wyoming service area during 2016. The new Demand-Side Management (DSM) potential assessment found much greater peak reduction potential through a combination of dispatchable load control and dynamic pricing programs, compared to PacifiCorp’s previous DSM potential assessment. PacifiCorp is the largest electric utility operating in Utah and Wyoming through its Rocky Mountain Power subsidiary. Boulder County, Colorado, has become the first local government in the Southwest to offer personal electric vehicle advising, as part of its Energy Smart advising service. The program will help residents learn about financial incentives, and what types of electric vehicles (EVs) best match their personal driving habits, as well as help in identifying their charging opportunities. SWEEP had recommended the program in a 2015 analysis of steps that the city of Boulder and Boulder County could take to increase EV adoption. A diverse coalition has asked the Colorado legislature to refer a sales tax increase proposal to voters to help the state’s overburdened transportation system. MPACT 64, a statewide coalition of local government groups, business associations and civic groups, sent the March 2 letter because under the state’s constitution voters must approve all tax increases. The letter to Colorado legislators asked them to refer a sales tax increase that would generate $750 million per year. The group also asked that 30 percent of the new funds be allocated to mobility services and infrastructure such as expanded public transit, bicycle lanes and paths, and pedestrian infrastructure. On the same day, 64 local elected officials from across the state released another letter asking that any new state transportation funding include public transit and bicycle infrastructure. SWEEP is a member of MPACT 64 and a signatory to the letter. Click here to read the MPACT 64 letter. Click here to read the elected officials' letter. Click here to read news coverage of the officials' letter. SWEEP has issued a new report, Industrial Recommissioning: Not Just a Building Tune-up. Industrial re-commissioning programs can help all sizes of industrial customers save energy and money. Through low-cost improvements to common industrial energy systems such as compressed air, pumping, process cooling, and refrigeration, customers can often save 10-20 percent of the energy consumption of the systems targeted. This report reviews features of six existing programs and provides a set of recommendations for successfully implementing a new industrial re-commissioning program. The Public Utilities Commission (PUC) of Colorado has approved a new two-year demand-side management (DSM) plan for Xcel Energy, the large investor-owned utility serving 1.4 million electric customers in Colorado. The PUC signed off on an unopposed Settlement Agreement in the docket reviewing Xcel Energy’s new DSM plan. Based on the approved budget, Xcel Energy will spend $100 million on electric DSM programs in 2017 and $98 million in 2018. In addition, the new DSM plan includes $13 million per year in funding for natural gas energy efficiency programs. The new DSM plan is designed to save approximately 425 million kilowatt-hours and reduce peak demand by 81 megawatts from energy efficiency and other DSM programs implemented annually during 2017-18. The annual energy savings targets are equivalent to nearly 1.4 percent of Xcel Energy’s retail electricity sales. The new DSM plan and Settlement Agreement include a number of program enhancements recommended by SWEEP including a Strategic Energy Management pilot program for large customers; addition of advanced rooftop air conditioner controls to the business cooling program; addition of smart thermostats to ongoing programs where cost effective; consideration of increased support for Net Zero Energy buildings, and consideration of an upstream incentive program for heat pump water heaters. SWEEP also helped convince other stakeholders to support or at least not oppose the Settlement Agreement. On Jan. 18, 2017, the board of directors of the Denver Regional Council of Governments adopted Metro Vision 2040, a long-range plan for land use and transportation in the Denver metropolitan area. The final plan includes targets of a 10 percent reduction in per capita driving and a 60 percent reduction in per capita greenhouse gas emissions from transportation. The plan also calls for a 25 percent increase in average density, and for most new growth to take place in urban centers. SWEEP served on the advisory committee for developing Metro Vision 2040 and advocated for strong sustainability goals. Public Service Company of New Mexico (PNM) customers will see additional opportunities to save money on their utility bills, thanks to the New Mexico Public Resources Commission’s (NMPRC) approval of PNM’s 2017 Demand-Side Management (DSM) plan. As part of the plan approval, PNM will continue its existing programs for residential, commercial and industrial customers and add a new program providing rebates to home builders for the construction of energy-efficient houses. Additionally, PNM will receive incentives for exceeding the minimum savings required to meet its Efficient Use of Energy Act goals. SWEEP worked with PNM, the NMPRC Staff, Coalition for Clean Affordable Energy, and Western Resource Advocates to develop the uncontested stipulation that was approved by the NMPRC on January 11, 2017. Read the commission's order here. Tucson Electric Power is giving away smart thermostats to limited-income apartment residents who want to conserve energy. Nearly 1,800 Nest Learning Thermostats are being installed in apartments throughout the greater Tucson area as part of a new pilot energy efficiency program.